It’s April and the sun is out. I’d watched people walking on the lake all week. Now it was my turn. Ann was already waiting for me at the boat launch ramp at the Lake Laberge campground. I picked my way down the ramp, deep in snow and studded with icy patches, pale sapphires amidst the brilliant white. Ann beckoned me as I stepped cautiously onto the lake. My brain acknowledged that the lake was frozen – at least 3 feet of ice – but the mind is another matter. “This is what those others you’ve been watching from the dining room window have been doing”, said the brain to the mind, “And none of those on skidoos, skis or snowshoes went through the ice”. Ann, watching my slow progress and clearly remembering how tentative I’ve been on uneven surfaces since I slipped in some mud in a village in Indonesia and broke my leg, scooted over. I climbed on behind her but only after she’d dug out a spare hat from her saddlebag. 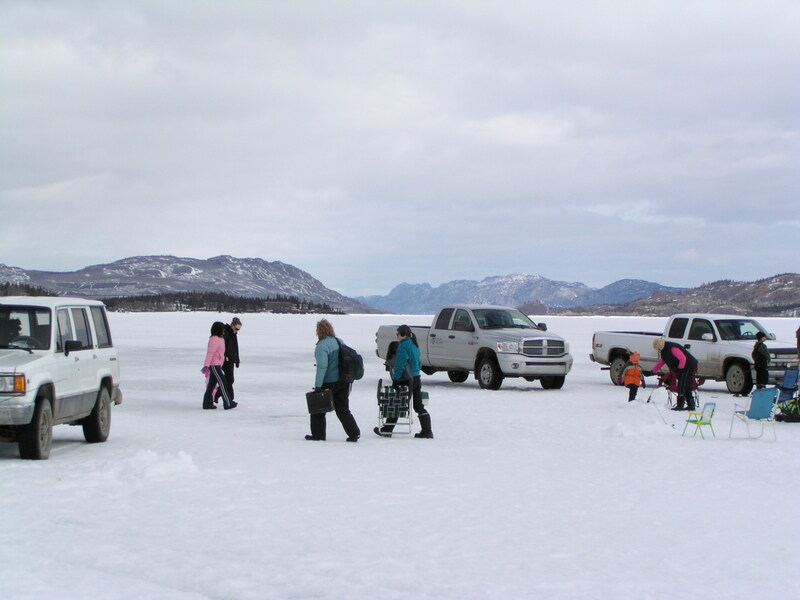 As we drew closer to the groups of people on the lake, I noticed a row of trucks and SUVs parked haphazardly. Once my amazement subsided, I laughed at the games my mind had played as I stepped onto the lake a few minutes ago. “Guess they’ll be mad at us”, shouted Ann over the roar of the engine. “The vibrations and noise will scare away any fish”. 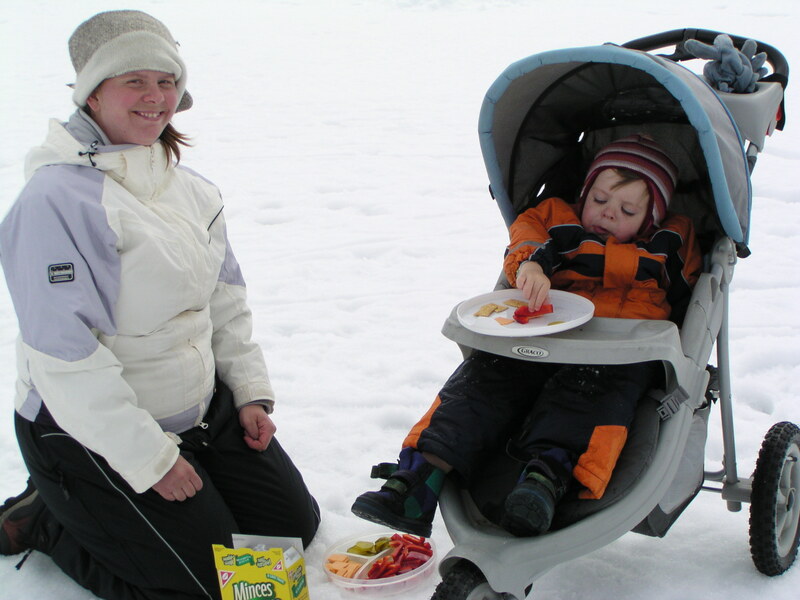 She brought the skidoo to a standstill and we walked the last few feet. I was glad I’d brought my telescopic walking pole as the snow was deep and every so often, just enough to give a little jolt, one of my feet would break through the crust and drop 6 to 8 inches to the surface of the lake. It was hard to pay attention to feelings of trepidation walking amongst groups of families ice fishing. One child in a stroller was eating lunch, a fond mother kneeling in the snow, watching him shove cheese and crackers into his mouth. 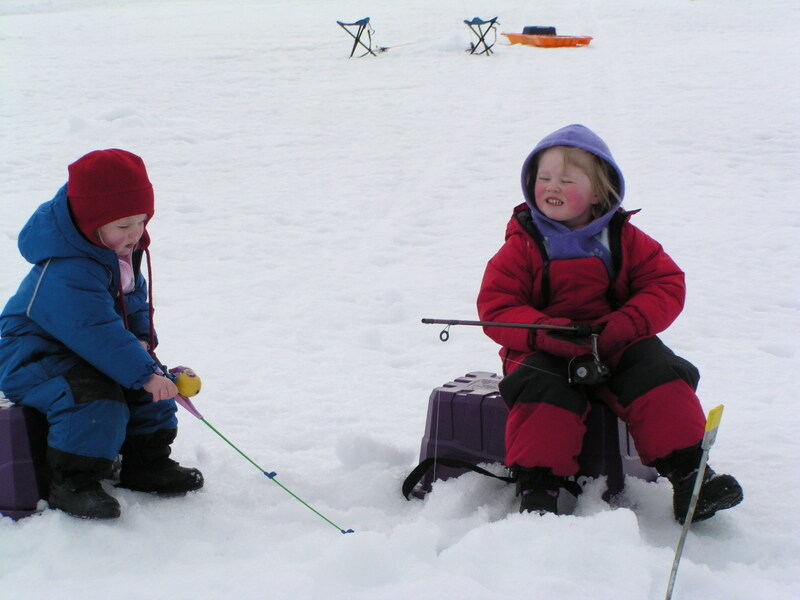 Two little sisters were dangling poles in a hole in the ice, encouraged by a father who somehow had arranged for them to ‘catch’ little plastic yellow fish. They excitedly jiggled their poles in my direction. The delight on their faces must have been his reward for cold, wet hands. One weary fisher person, impossible to know the gender, was slumped in a canvas chair, dead to the world. There were lots of dogs and one little girl was enticing hers to eat lunch but he (it could only have been a he), insisted on wrapping his leash around the chair leg. She gave up in disgust and he figured out how to reach his bowl. 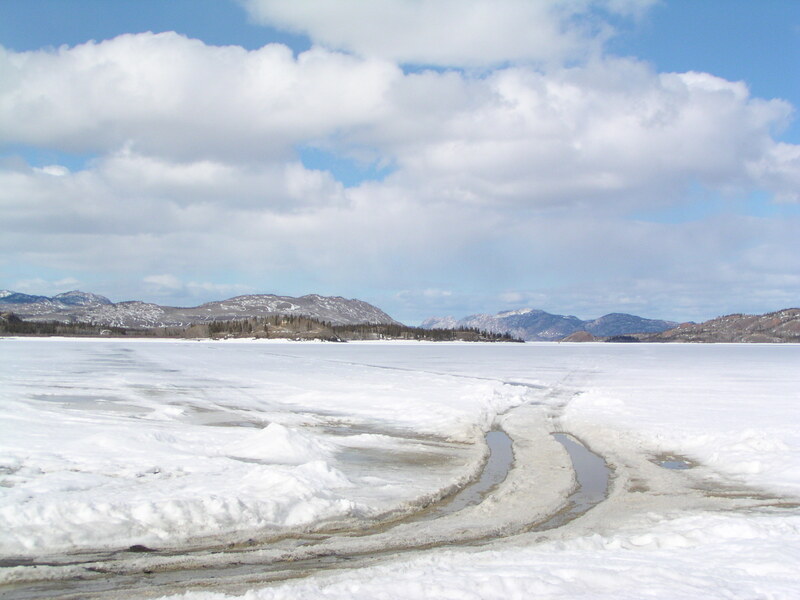 I’d seen a truck and a lone person on the ice earlier in the morning and wondered what they were doing. Now I could see the results of their work. 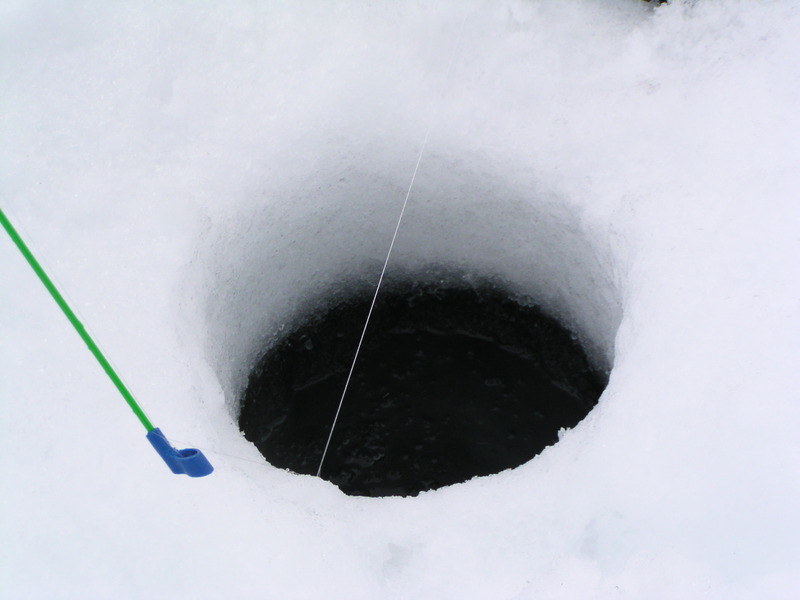 They’d used an auger to bore holes in the ice. Each little group of people was clustered around a borehole, the surrounding area littered with the bric-a-brac normally associated with a picnic. They’d brought chairs, coolers (coolers and it’s still 5 below Celsius! 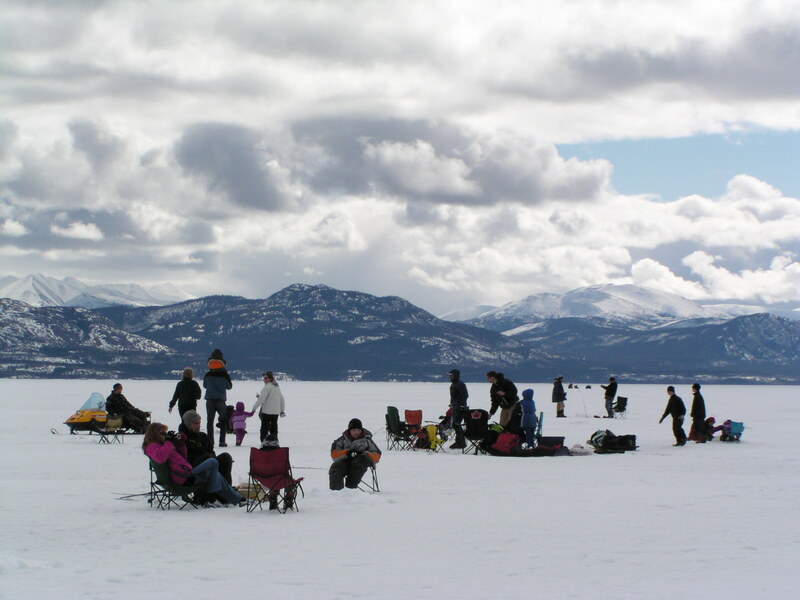 ), fishing tackle and all the other paraphernalia you need to enjoy a day at the lake. “They’re not catching anything”, said Ann. “Usually you get good burbot”. Burbot are a cod-like fish that are silly enough to swim close to the boreholes. They are also said to make burrows in the sand at the bottom of the lake. No one quite knows why. But they are not biting today. Maybe they are wallowing in their burrows. We inspected a few holes and saw that the unattended ones were already candling (freezing around the edges). “Yes, there really is water beneath your feet”, said the brain to the mind that had all but forgotten. “How about a ride around Richthofen Island?” asked Ann. “Why not?” said the brain before the mind had time to catch its breath. Richthofen is a long, slender island that stretches down Lake Laberge for several kilometers. It’s named after a relative of the famous Red Baron, a German ace pilot in the First World War. I can see the southern tip from my dining room window. The skidoo glided at quite a clip towards Richthofen, which didn’t seem to be getting any closer even though the ice fishing groups were now mere dots on the vast expanse of frozen lake. I sat behind Ann, clutching the warm handlebars on each side while the mind chattered nearly as loudly as the skidoo’s engine. The main story that looped endlessly was of the Inuit hunters who went through the ice each year when I lived on Baffin Island in the early 70s. Each spring it happened, a blue sky and thoughts of fresh seal meat luring them across Frobisher’s Bay. Sometimes a companion returned to tell the tale but often it was a lone hunter who never returned. 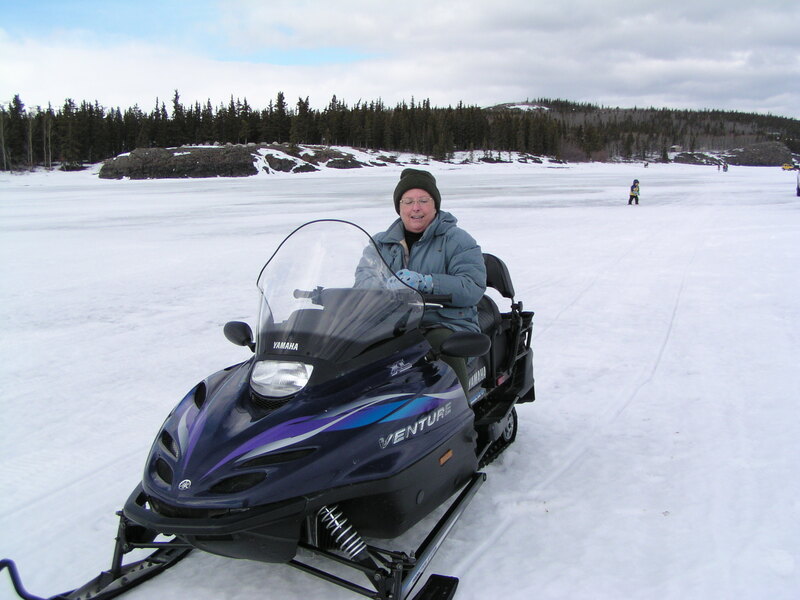 The fact that death would be very quick did little to calm my overactive imagination as Ann and I bombed across Lake Laberge. We finally reached and rounded the southern tip of Richthofen (the one that looks so close from my window), and I began to notice the tracks in the snow. 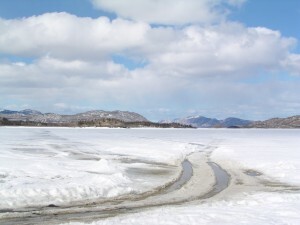 Not ski tracks or snowshoe tracks but four-wheel drive tracks! Lines stretched across the lake like Nazca lines in the desert in Peru. One set went straight across the lake to the other side. “That goes to Cathers’ place”, yelled Ann. (Cathers are a well-known Yukon family that live on the east side of the lake. They keep dogs and offer outdoor adventures. Sometimes in the spring I’ve heard the high-pitched howl of their dogs from across the lake and had guessed at the direction. Now I had a much better idea of where the family lived.) We followed the other track along Richthofen Island. Occasionally we stopped and Ann switched off the engine. The silence was immediate, all encompassing and totally overwhelming. Like all intense silence, it was alive with sound, the tinkling some call the music of the spheres. 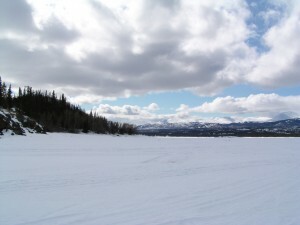 The vistas on all sides were compelling, especially the view north where the lake narrows into the Thirty Mile river. It whispered, “Come hither”. 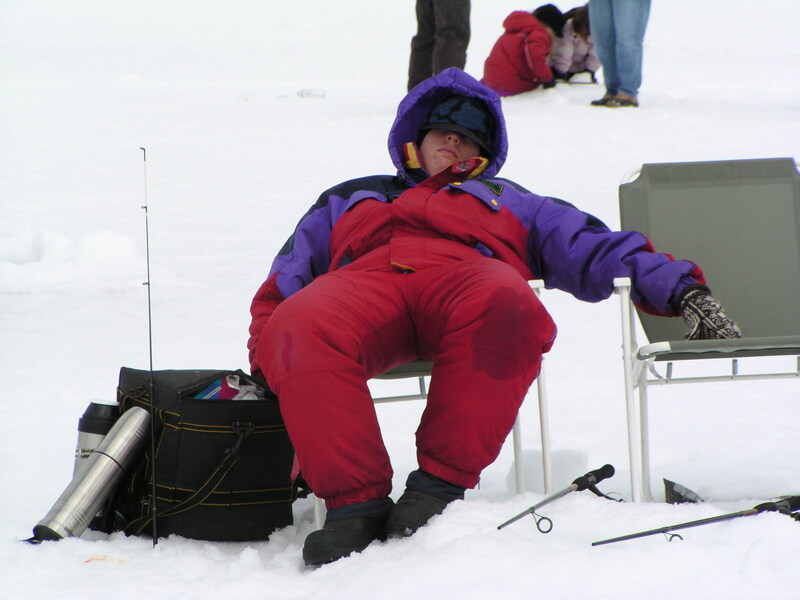 Towards the north end of Richthofen, we came across an SUV, clearly ice fishing away from the crowd. In a small bay just before we rounded the tip was another one – looking almost stranded in deep snow. So much activity in what I had envisioned as a desolate wilderness. At the north end of the island, we left the main track that continued on down the lake and rounded the point. Within minutes we spotted two black dots moving slowly across the ice. 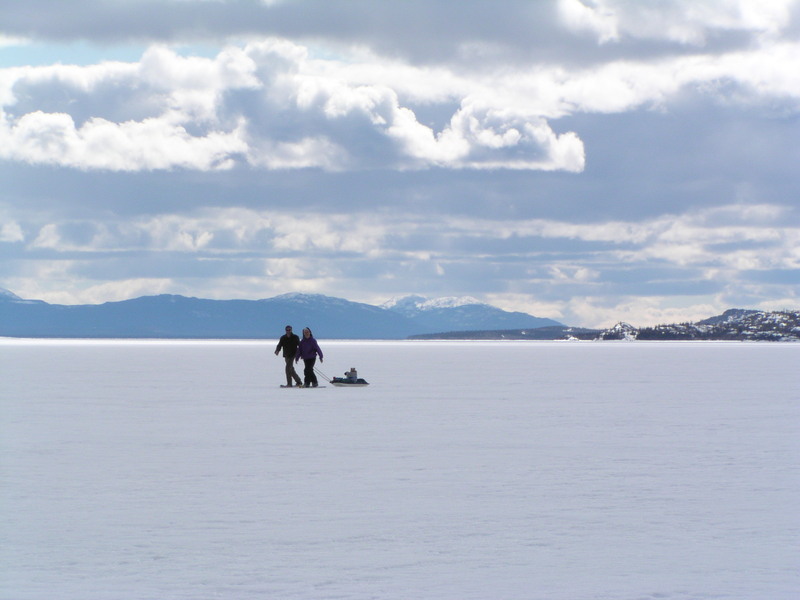 As we came closer, we could see it was two of our neighbours, snowshoeing across the lake for a picnic and an afternoon of ice fishing. 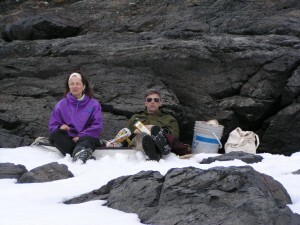 We joined them, lazing against the black rocks of Richthofen, warmed by the sun and nibbled cheese and crackers. The trip back to the boat ramp at the campground seemed to take minutes. Most of the families had packed up their kids and dogs and headed for home. I got off the skidoo and walked slowly towards the shore. The mind was very quiet, lulled by the vast panoramas, finally accustomed to riding over water. Hi. This is beautiful. Looking for a new adventure for the family. Does the lake ever get warm enough to swim? 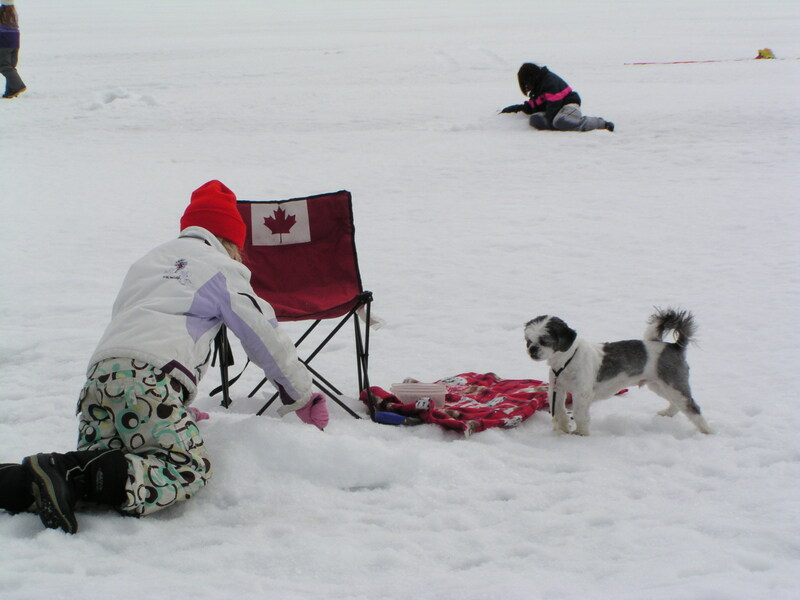 The lake defrosts by the end of May and some of my hardy friends take a dip in mid-summer! Not quite a polar bear swim in the summer.